In April 1975, South Vietnamese Air Force Major Buang-Ly made the critical decision to evacuate his wife and five children from Saigon into the unknown, knowing that if they stayed the Communists would kill them. He loaded them into a small two-seat Cessna O-1 Bird Dog airplane and took off from a small island off of Saigon. Flying out to sea, he reached the USS Midway – CVA-41- one of the American ships involved in Operation Frequent Wind. April 29, 30, 1975, are two days that many Americans remember as the two days that forever changed their lives. 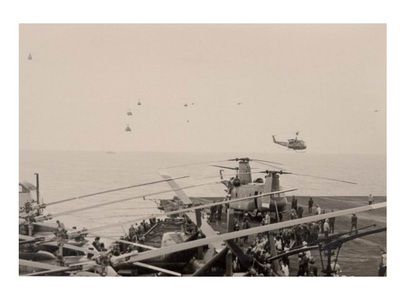 During these two days, Saigon fell to North Vietnamese forces, leaving thousands of South Vietnamese and Americans to be evacuated during Operation Frequent Wind, an armada of aircraft and ships that comprised the largest helicopter evacuation in history. 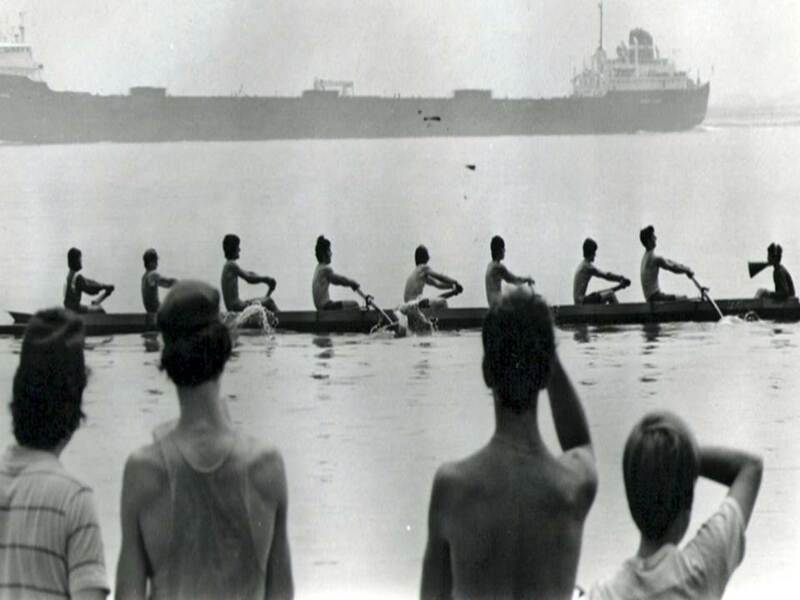 In those desperate days countless South Vietnamese escaped by themselves in boats or airplanes. When South Vietnam collapsed, hundreds of boats and ships, VNAF (the official military of South Vietnam from 1955-1975) helicopters and fixed wing planes sailed or flew to the evacuation fleet off the coast of Vietnam. So many helicopters came that they clogged ship decks and many were eventually pushed overboard to make room for others to land. American military officials instructed many helicopter pilots to drop off their passengers and then fly off and ditch in the sea where they would be rescued. The statistics for Operation Frequent Wind attest to its scope and effectiveness. A total of 1,373 Americans and 5,595 Vietnamese and people from other countries were evacuated by helicopter. The total number of Vietnamese self-evacuated or rescued in Operation Frequent Wind and resettled in the United States reached more than 138,869 people. Statistics only tell part of the story of Operation Frequent Wind and the role that American ships and planes played in the mass evacuation, and statistics don’t reveal the human sides of the story. The story of Major Buang-Ly and the Americans aboard the aircraft carrier USS Midway who helped save him and his family evokes the whirr of helicopters, refugees crowding the decks of aircraft carriers and other ships, artillery fire on besieged Saigon, and the fierce determination of one man to save himself and his family. 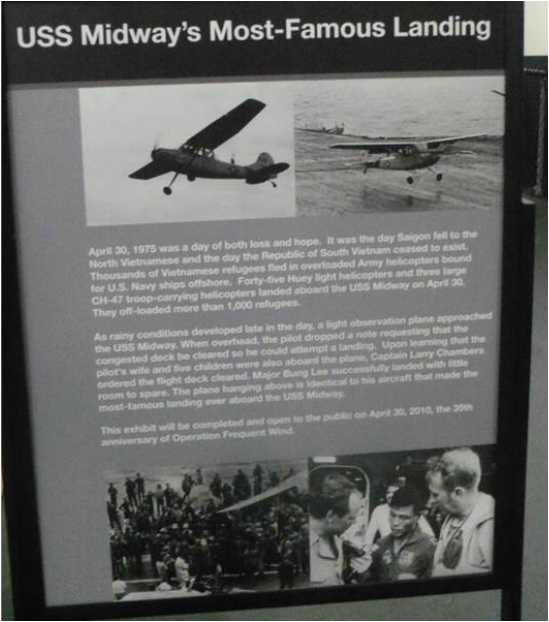 Major Buang-Ly flew his two-seat Cessna, searching for a ship to land on, and he finally spotted the USS Midway. He circled the ship two or three times and then he flew down the flight deck, attempting to drop a note to the crew. The first two notes blew over the side, but the third one landed on deck. The note said: “I can land on your runway, would you please move the helicopters to the other side of your runway. I have one more hour of fuel, would you please rescue me?” It was signed Major Buang, wife and five children. In a 2010 radio interview by Maureen Cavanaugh and Natalie Walsh of KPBS Public Radio broadcast from the flight deck of the USS Midway, now a museum ship in San Diego,CommanderVern Jumper, then Air Boss of the USS Midway, and Admiral, then Captain Lawrence Chambers reconstructed the rescue. The USS Midway was positioned about 35 miles off the coast of Saigon and Air Boss Jumper and his crew at first decided to have Major Buang ditch the plane alongside the ship and put swimmers in the water and rescue him. Instead, Captain Lawrence Chambers decided on a different course of action, fearing that if Major Buang ditched in the water the plane which was a tail dragger would nose over and it would have been impossible to rescue its passengers. Captain Chambers decided to take the plane and its occupants aboard the USS Midway and asked Air Boss Jumper to give him a ready deck. According to Air Boss Jumper, helicopters, mostly Huey helicopters, littered the entire flight deck and they had to clear the angle deck. The Huey helicopters were on skids with no wheels on them and they weren’t easy to move around, but the flight deck crew cleared the angle deck in short order. He remembered that it had rained that day and the deck was slick, but they finally cleared a no pitching deck, no deck movement at all. Major Buang landed in the right spot, bounced once, rolled up the deck. The flight deck crew rushed to grab the plane before it reached the angle deck, but it stopped in time. Major Buang and his wife who held a baby in her arms jumped out of the cockpit and pulled the backseat forward. Four children scrambled out of the back seat. When Major Buang landed, the flight deck crew and other sailors in the ship’s company ran to the flight deck, cheering because they were so proud to have helped save the courageous major and his family. Major Buang-Ly’s aircraft carrier landing was even more remarkable because even though he had flown more than four thousand hours in his airplane, he had no carrier landing experience and he didn’t know for certain if the aircraft carrier would let him land. He had less than an hour of fuel when he circled the ship and he needed about an hour and a half to make it back to dry land. The sailors escorted Major Buang to the bridge where Captain Chambers congratulated him for his outstanding flying skills and his courage. He so impressed the crew of the USS Midway that they established a fund to help resettle Major Buang and his family in the United States. The rescue of Major Buang-Ly and his family provides indelible human images for the history of the Vietnam War. Admiral Chambers and Commander Jumper sketched other haunting images of Operation Frequent Wind and the part that the USS Midway played in it. These images include lines of refugees following ropes off the flight deck into a safer part of the ship, helicopters being pushed into the sea to make room for refugees, and helicopters landing and taking off amidst the crowds of people. Retired as an aircraft carrier, the USS Midway now operates as a Museum Ship in San Diego Bay. 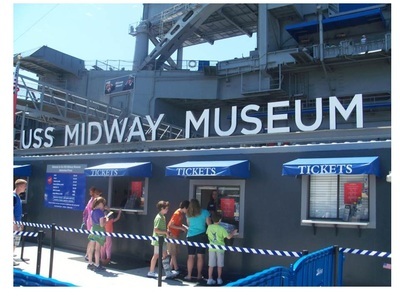 Commissioned in 1945 a month after the end of World War II, and serving through the Cold War, Vietnam, and Desert Storm until 1992, the USS Midway’s mission has been transformed to serving as an educational, museum, and commemorative ship. Admiral Chambers and Commander Jumper recount their experiences aboard the USS Midway as part of the historical record of the ship and American History, and the personal history of Major Bung, his family, and other Vietnamese-Americans. Commander Vern Jumper considers the events of Operation Frequent Wind and the USS Midway’s part in it both sad and happy. Clayton, I.B. USS Midway (CV-41). Classic Warships Publishing First Edition, 2005. McGaugh, Scott. USS Midway: America’s Shield. Pelican Publishing, 2011.